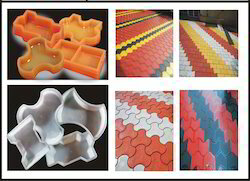 Providing you the best range of silicone plastic cover block mould, zigzag silicone paver block mould, dumble silicone plastic paver mould, sand blast silicone plastic paver mould, kida silicone plastic paver mould and dabbi silicone plastic paver mould with effective & timely delivery. Our firm is providing a vast range of Paver Block Moulds to vast client base across the nation. We develop these moulds implementing modern technologies and qualitative material. The entire items are tested on various quality grounds to ensure its authenticity prior to final shipping. These are available in various quantity packaging. Our firm is providing a vast range of Paver Moulds to vast client base across the nation. We develop these moulds implementing modern technologies and qualitative material. The entire items are tested on various quality grounds to ensure its authenticity prior to final shipping. These are available in various quantity packaging. 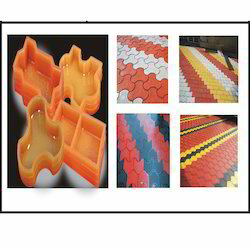 Js designer tiles product instrumental in offering clients an effective range of PVC Paver Moulds. This Paver can be used for interlocking and chequered tiles , footpath, exterior of houses, offices and gardens. Fabricated using high grade Silicon rubber raw material and latest technology, these are designed in compliance with international quality standards. These are acknowledged among clients for their sturdy construction, easy to install maintain features, superior finish and wear. The Silicon rubber used for making this Paver Block Mould is Super and Nitrile-PVC Blend. We also manufacture Uni Paver Block, Square Paver Block, Damru Paver Block, Colarado Paver Block, Square Paver Mould And All Chequered Tiles in all sizes. Our firm is providing a vast range of Interlocking Tile Moulds to vast client base across the nation. 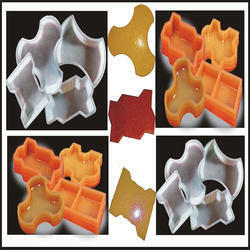 We develop these moulds implementing modern technologies and qualitative material. The entire items are tested on various quality grounds to ensure its authenticity prior to final shipping. These are available in various quantity packaging.